From British Columbia to Nunavut, how the Indigenous music scene is producing genre-spanning sounds and new opportunities for cultural understanding. In 1995, Leonard Sumner had never been to a nightclub. His community, the Little Saskatchewan First Nation in Manitoba, was light years away from glossy, big city nightlife. The area was surrounded by rolling plains, thick forest and vast freshwater lakes. There weren’t any nightclubs. There wasn’t even a record store. Obsessed with the hip-hop exploding out of New York and Los Angeles in this era, the then-adolescent Sumner wanted to be like his rap idols. He could rhyme and write music, but his lyrics about clubbing and money felt bogus. His life on the reservation as very different from those of the platinum-selling artists popping bottles south of the Canadian border. But as he got deeper into his craft, Sumner realized he could emulate his influences simply by telling his own story with the same vivid honesty with which they were proclaiming theirs. He sat down to write about his world and found the lyrics flowed easily and in abundance. With this shift, he was making music connected not only to hip-hop, but also to his own ancestors. Sumner immersed himself in music, releasing his debut album, Rez Poetry, in 2013. Lyrics about life, death, hope, dreams, addiction, and the northern lights of his homeland weren’t all happy, but they were honest, and they were his. The album’s success led to Sumner playing major music festivals throughout Canada, which helped establish him as a key player in the country’s Indigenous music scene. From the pristine glaciers of Nunavut to the towering mountains of British Columbia, Indigenous musicians are in the midst of a renaissance as a new wave of artists reclaim their histories and collectively redefine what “Indigenous artist” even means. These singers, instrumentalists, beat makers, and curators are creating and sharing music that celebrates thousands of years of cultural heritage through styles both traditional and innovative. This music addresses the challenging history Indigenous peoples' have with Canada while celebrating the resilience of their cultures. Through music, Indigenous musicians are educating audiences and fostering cross-cultural understanding. This is not just entertainment; it’s revolution. Up in Nunavut’s capital city of Iqauluit, roots rock band The Jerry Cans preside over the northernmost outpost of the scene, a place where the sun rises for four hours a day in the winter and lights the midnight sky at summer’s peak. This five-person group performs in Inuktitut, an Indigenous language widely spoken throughout Nunavut but considered vulnerable by UNESCO. Through their output, The Jerry Cans are celebrating and preserving Inuktitut and, with online streaming, sending the language to places on the planet that would never have encountered it otherwise. The band’s singer, Nancy Mike, also incorporates traditional Inuk throat singing. Intense and transportive, throat singing is meant to emulate the sounds of nature—animal calls, thunder, crashing waves—and is thus intimately connected to Nunavut and the people who have called it home for millennia. As the tradition has been resurrected, so too has it evolved. Inuk throat singing icon Tanya Tagaq has performed with symphonies, electronic acts, and rock bands around the world. In 2015, two adolescent throat singers stole the show when they performed at Prime Minister Justin Trudeau’s 2015 swearing-in ceremony. (“I got verklempt seeing throat singing at the swearing in. <3” Tagaq tweeted after.) Nelson Tagoona, a 24-year-old artist from Baker Lake in central Nunavut, combines throat singing with beat boxing in a style he calls “throat boxing.” He’s performed throughout Canada, including a 2017 performance with the Toronto Symphony Orchestra. Meanwhile, venerable electronic group A Tribe Called Red has long incorporated traditional powwow singing, drumming, and dancing into performances rooted in digital music. But Indigenous music extends well beyond genres traditionally associated with Indigenous peoples. Sumner’s work is hip-hop and country. The Jerry Cans make soaring roots rock. Jarrett Martineau is the founder of Toronto-based Indigenous music platform and record label Revolutions Per Minute and hosts a CBC radio program “Reclaimed.” The show features music from different genres, eras, and Indigenous cultures worldwide. While it was a major victory when the Juno Awards (Canada’s version of the Grammys) added the Indigenous Music Album of the Year category in 1994, many artists who fell in that category now just want to be judged by the same criteria as everyone else. This perspective continues to gain influence and attention. At the 2018 Juno Awards, A Tribe Called Red won the award for Group of the Year, while The Jerry Cans—nominated for Contemporary Roots Album of the year and Breakthrough Group of the Year—performed during the ceremony, presenting the once almost lost throat singing tradition to 1.5 million viewers across the country. Once in the spotlight, many First Nation artists use their platforms to bring attention to issues in their communities. In 2014, Tagaq won the Polaris Prize–awarded for the year’s best Canadian album–for her work “Animism,” on which she addressed issues related to environmental degradation. During the ceremony she performed barefoot in front of hundreds of names of missing and murdered Indigenous women, receiving the night’s only standing ovation. When guitarist Derek Miller won the Juno for Aboriginal Recording of the Year in 2008, he accepted his award by saying he wished his community had clean drinking water. In this way, the music scene’s expansion is greater than the sum of its parts. Sinclair recalls a quote from Métis leader Louis Riel, who in 1885 stated, “My people will sleep for one hundred years, but when they awake, it will be the artists who give them their spirit back.” In the aftermath of colonialism, musicians are reinvigorating their communities, traditions, and messages. This awakening is fostered by the exceptional depth and beauty in Indigenous art forms, from the precise choreography of powwow dancing to the hypnotic rhythm of the drums to the layers of meaning held in many songs and performances. And as new styles and traditions emerge and spread, the magnitude of this awakening grows. This process is not exclusive to the hundreds of Indigenous nations across the country. 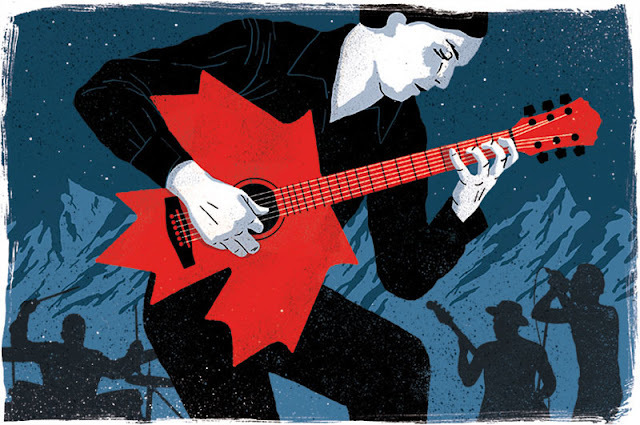 Visitors to Canada have an abundance of opportunities to experience the music scene and the cultures inherent within it. In May, the 13th annual Manito Ahbee Festival celebrates Indigenous arts, culture, and music in Winnipeg, Manitoba. The city will also host Indigenous artists from around the world for sākihiwē festival June 15-17. In Ottawa, the Summer Solstice Indigenous Festival attracts tens of thousands of attendees for four days of music, dancing, food, elder teachings, and an area focused on reconciliation through art. Festivals and gatherings in the Yukon, Nunavut, Saskatchewan, Quebec and more will host hundreds of musicians and other multidisciplinary artists into the fall of 2018. These experiences are a subtle form of adventure tourism, with visitors challenging their preconceived notions rather than their bodies and finding new ways of relating to other cultures and the individuals within them. In this, the reclamation of spirit and healing of communities is possible for everyone involved. “The most important thing is telling the truth about your existence and your story,” says Sumner, whose latest album, “Standing In the Light,” addresses prayer, faith, forgiveness, healing, corruption, broken treaties, and the water that flooded the reservation on which he first dreamed of becoming a successful musician. Katie Bain is a writer in Los Angeles. Her works appears in publications including VICE and LA Weekly. She grew up near Green Bay, Wisconsin, where she developed a love of nature that has brought her on assignment to rural regions of the United States, Israel, Peru, Mexico and Canada.